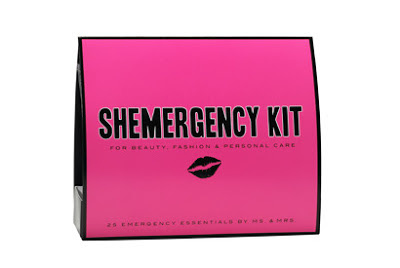 THE MARTINI CHRONICLES: Divas Must Have...A Shemergency Kit! Divas Must Have...A Shemergency Kit! Divas, I recently stumbled upon something that has revolutionized my entire life...well, maybe that's a bit extreme, but I did find a product that every professional woman should have in her work bag. Allow me to set the scene. You're in a taxi on your way to a job interview and you carelessly popped off the top button of your blouse. Or, you're in your office quickly changing into a little black dress for a company cocktail reception and you realize that you've smeared white deodorant remnants on your dress. Or, you found yourself extremely famished during lunch and ate an entire rack of ribs...the proof is in the little pieces of rib that have lodged themselves between your teeth. Let's just face the fact that sh*t happens! And when they do, you should have a Pinch Provisions Shemergency Kit in reach! What's a Shemergency Kit? 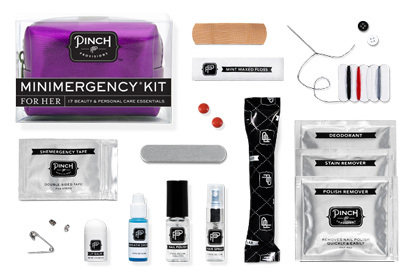 The Shemergency Kit is an amazing product from Pinch Provisions which contains 25 items that women find themselves needing to rectify common mishaps. Each kit contains the following items: a folding hair brush with mirror, hair spray, clear elastic bands, earring backs, hand lotion, a nail clipper, an emery board, clear nail polish, nail polish remover, a mending kit, a safety pin, double-sided tape, a lint remover, shoe shine towelettes, stain remover, static remover, breath freshener, lip balm, dental floss, pain reliever, deodorant towelettes, a tampon, adhesive bandages, facial tissues, and blotting tissues. The Shemergency Kit is portable, and can be highly effective in resolving the common mishaps that we encounter. The Shemergency Kit will run you only $25, which is a steal considering its potential to avert a number of different disasters. If you're looking for a mini version of the Shemergency Kit, Pinch Provisions offers the Minimergency Kit, which contains 16 items. The mini versions start at $13...again, a steal! I can go on and on about the Shemergency Kit, but I won't. I will simply say that every Professional Diva must have one...or more. If you would like to see for yourself, check out Pinch Provision's website. You can thank me later! Disclaimer: I was not solicited or paid by any one or any company to blog about the Shemergency Kit. I simply think it is an awesome find for Professional Divas, and I wanted to share...because I'm all about sharing!